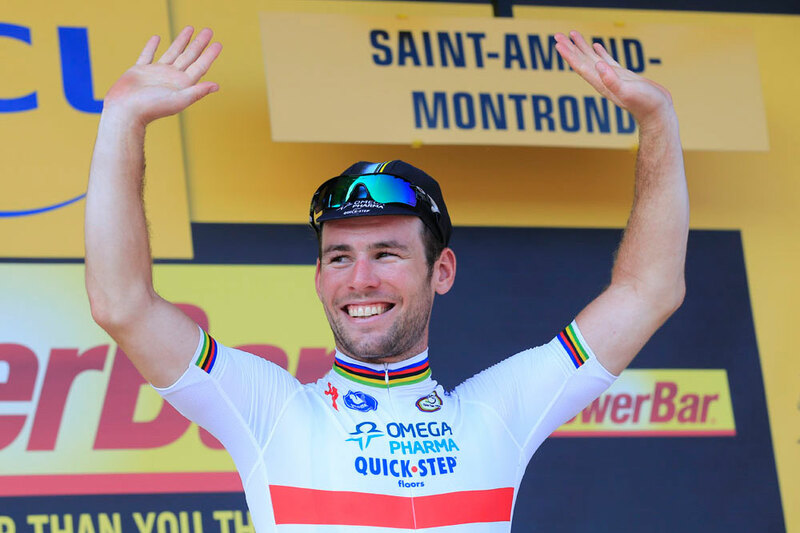 Mark Cavendish scored his second stage win of the 2013 Tour de France, outsprinting Peter Sagan, but the big news was the carnage caused by Omega Pharma in the crosswinds. Pan flat and warm, this 173km stage between Tours and St Amand Montrond had bunch sprint stamped on it in the route book. Ah, but this is the Tour and there are no easy days and little in the way of predictability. After a six man group went clear after only two kilometres, most imagined the usual scenario: a four minute lead for the six man break, reeled by sprinters teams with 10km to go and a bunch sprint contested by Cavendish and co. But not today. After around 55km, a rising 20kmph crosswind over the rider’s left shoulder blew up, Omega went to the front and wound the pace up and – crack – the peloton split in three. Argos-Shimano sprinter Marcel Kittel was on the wrong end of the bunch, the speed at the front increased and the morning break was swept up, their three minute gap vanished inside five kilometres. It was a bold, pre-planned scenario – Omega DS Wilfried Peeters said the team was ready to ride all the way to the finish to keep Kittel out of contention. But there was more drama when second overall on general classification Alejandro Valverde punctured. Four Movistar team mates stopped with Valverde to try to pace him back to the leading echelon, led by a charging Omega Pharma-QuickStep – including Cavendish – with Belkin giving a hand. The fact that the Dutch team piled to the front when Valverde punctured raised eyebrows. Was it OK to attack a rider who has been dropped in these circumstances? Or just OK to attack Valverde? With Valverde second overall looking in danger, Rui Costa dropped out of the front group because Valverde and this three team mates were struggling to match the horsepower of the flatlanders, leaving best Movistar’s best young rider Quintana alone up front. Never has a 12 second gap looked so hard to close and it never was. At the line, Valverde had lost almost 10 minutes and, surely, all chance of making the podium of the Tour. But there was even more drama to come after Valverde’s badly-timed puncture. 30km from the line – after 100km of sidewind carnage – no fewer than five (out of eight left in the race!) 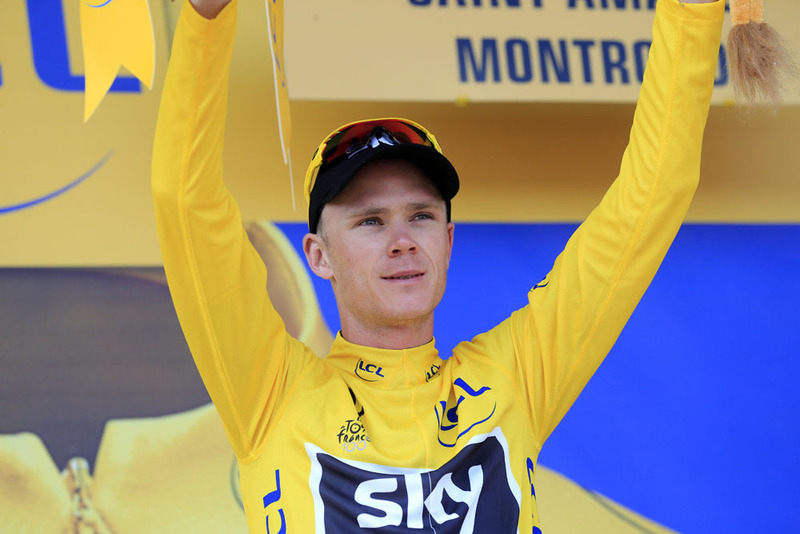 Saxo Bank-Tinkoff decided to join the party, forcing another, smaller echelon of 14 riders and catching Froome off guard. An astonishing stage got even more bizarre. Contador’s troops aided by the Omega trio of Sylvain Chavanel, Niki Terpstra and Cavendish, Cannondale duo Peter Sagan and Maciej Bodnar, Astana’s Jakob Fuglsang with Belkin pair Bauke Mollema and Laurens Ten Dam, pinged off the front and went on a 30km team time trial. It was getting hard to keep up with the changes and splits on the flat roads, with the Tour spread over almost 13 minutes. 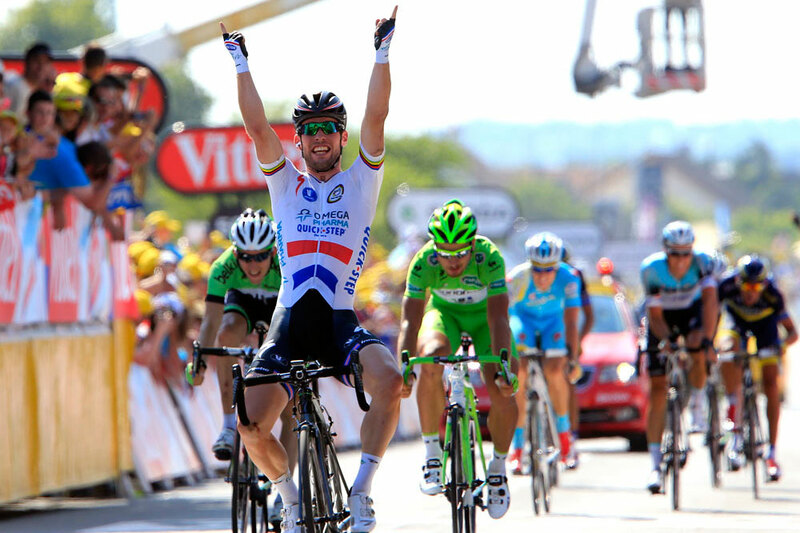 Chavanel started to lead the sprint out with Sagan on his wheel, but the Slovak was towing Cavendish up to speed and the British champion sped past the green jersey to take an easy win – his 25th in the Tour. Well, easy except for the fact that it had taken a 100km lead out!